July has been a good reading month for me – I’ve read eight books and enjoyed most of them – but not a good blogging month! I’ve only had time to write about three of the books I read, so I’ll have to catch up with the others in August. And here are the other books I’ve read this month. I’ll be posting my thoughts on them soon, I promise! The Queen’s Confidante by Karen Harper – I requested this through Amazon Vine as I had enjoyed Karen Harper’s last two books. This one sounds a bit different to the usual Tudor novels, focusing on the death of Henry VIII’s brother, Prince Arthur, and the mystery of the Princes in the Tower. In a Treacherous Court by Michelle Diener – Review copy from Simon & Schuster. I haven’t heard anything about this book or author but it sounds like another interesting historical fiction novel. Race of Scorpions by Dorothy Dunnett – Third in the House of Niccolo series. I bought this for myself so I would have it ready for when I finished reading The Spring of the Ram. Goodbye for Now by Laurie Frankel – Review copy from Headline. Another book I knew nothing about, but I’m intrigued by the synopsis. The Dog Stars by Peter Heller – Another review copy from Headline. This is a post-apocalyptic novel, not one of my favourite genres but I’ll give it a try. I don’t really have many plans for my reading in August, but I’m intending to take part in the Austen in August event hosted by Adam of Roof Beam Reader. I’ve already read all of Jane Austen’s novels, but I want to read Emma again as it was the only one I didn’t enjoy the first time and I would like to give it another chance. How was your July reading? July was a month of re-reading for me. A friend and I had decided to do this after talking about the books we wantedto revisit. It was great! I read 12 books though one wasn’t a re-read. In August I will try to just read Virago Modern Classics. A month of re-reads sounds like a wonderful idea! I’d love to do that myself sometime. Good luck with the VMCs in August. 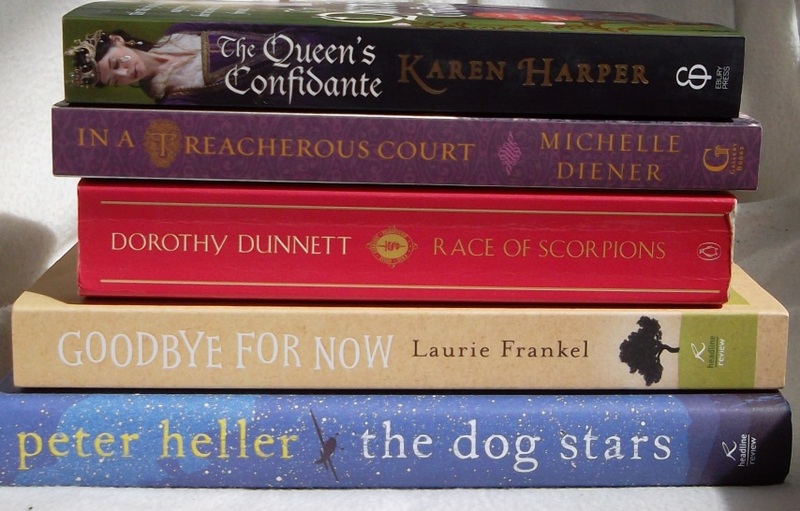 I read a great variety of books in July and it was really stimulating. I enjoyed participating in the Rosamond Lehmann Reading Week and Paris in July. I look forward to reading your other reviews soon and to seeing what you think of your re-read of Emma. I was hoping to participate in Paris in July too, but just didn’t have time. Maybe next year. I loved The Spring of the Ram and am hoping to start Race of Scorpions at the weekend. I still prefer the Lymond Chronicles, but I’m really enjoying this series too. I read 8 in July, but with everything getting behind with reviews. Look forward to hearing about the Louise Douglas book as I have that to read too. As I have most of August off, I may well venture into some Austen. Thinking Northanger Abbey? Northanger Abbey would be a great choice. It’s one of my favourites. I hope you enjoy the new Louise Douglas book – I thought it was even better than her previous one, which I loved. I read ‘In a Treacherous Court’ in July – it was enjoyable and a nice easy read for the summer, the 2nd book featuring these characters. The Queen’s Confidante sounds like it’s worth seeking out. I’m glad to hear you enjoyed In a Treacherous Court. I didn’t know she’d written another book with the same characters.